November 18, 2018 marks the second annual World Day of the Poor. Last year, Pope Francis suggested the Catholic Church set aside one day each year when communities can “reflect on how poverty is at the very heart of the Gospel.” He designated this day as the World Day of the Poor, and it will be celebrated on the 33rd Sunday in Ordinary Time each year. 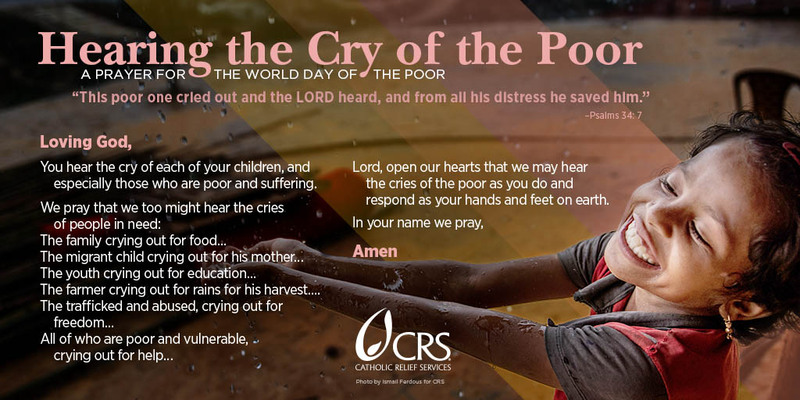 In this year’s World Day of the Poor message, Pope Francis reflects on Psalm 34:7, “This poor man cried, and the Lord heard him.” He challenges us to use the World Day of the Poor as an opportunity to make an examination of conscience and consider whether we truly do hear the cry of the poor. Throughout salvation history, God answers the cries of the poor and shares in their suffering. His response is always a saving and healing act. In the World Day of the Poor, we join God in responding to the poor and ensuring our brothers and sisters in need do not feel alone or abandoned. Pope Francis says that to hear and respond to their cries, we must be in relationship and get to know people who are poor. He encourages parishes around the world to join in solidarity with people who are poor in their communities through a communal action, like praying together or sharing a meal. 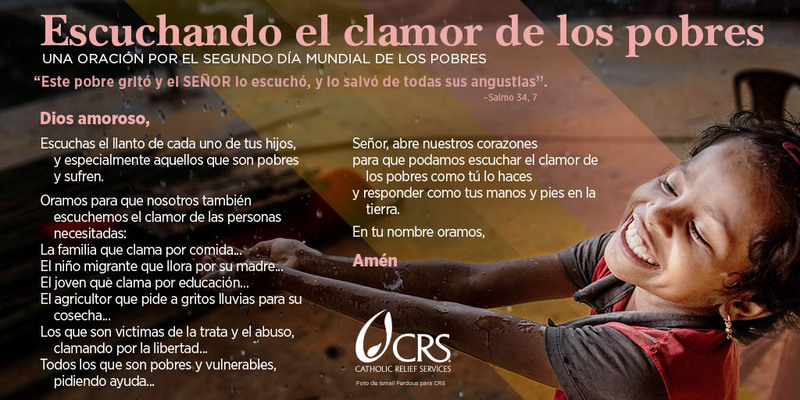 Use these prayers, general intercessions and bulletin insert (in English and Spanish) leading up to or on the World Day of the Poor this year. Advocating on behalf of people who are hungry and living in poverty. After sharing a meal together, invite parish members to send emails to Congress, asking that they prevent global hunger and malnutrition. You can also invite your community to text the word GLOBAL to 306-44 to sign up for Catholics Confront Global Poverty, a joint advocacy initiative of the USCCB and CRS. Raising money for the poorest and most vulnerable people worldwide. Design your own community fundraiser to support the needs of the poor around the world.